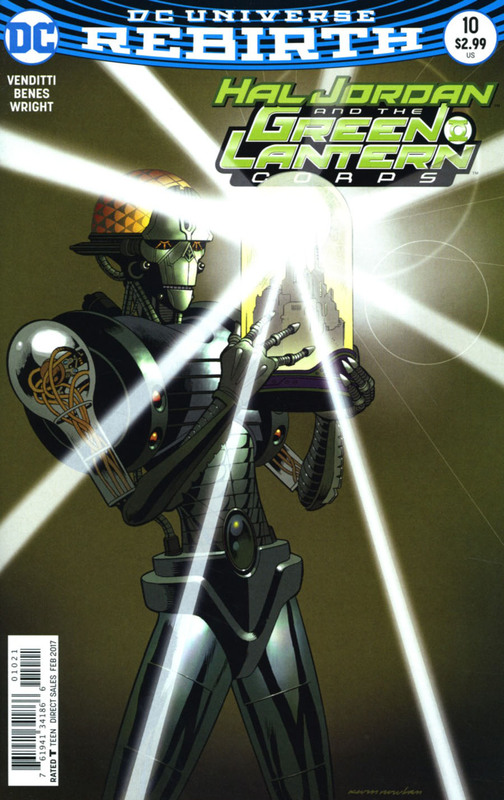 Brainiac scans the bottle city of Xudar, which now contains both Green and Yellow Lanterns. Brainiac catalogues each member of each Corps, according to their planetary race. All the while mentioning the "Grand Collector" and how pleased he will be. 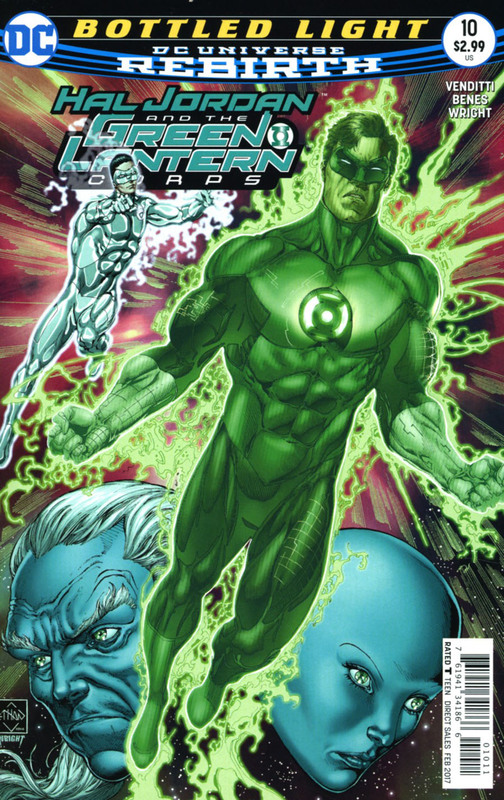 Meanwhile on the planet Nok in sector 2814, Ganthet and Sayd tell the newly arrived White Lantern, Kyle Rayner that Hal Jordan is trapped within his own Green Lantern ring. They explain that only he as a White Lantern can bring him back from where he is trapped. We then see Hal being led by Abin Sur to the place where all other fallen Green Lanterns are gathered. He meets with them all, and is greeted by Tomar-Re and Katma Tui. He tells them that their loved ones are doing well, and that they miss them. Abin Sur again reminds Hal that he doesn't belong, and must go back to the realm of the living. At that moment, Kyle manages to break through, and bring Hal back to the living realm. We end with Brainiac arriving in the Vega system. Where there is no sort of intergalactic peacekeeping force such as any Lantern Corps. He presents the bottled city of Xudar to the mysterious "Grand Collector," who is then revealed to be non-other than Larfleez, The Orange Lantern. Story - 5: Yet another great issue. This was really more of Hal centric one, which is understandable seeing as how he is the star of the book. However, like last issue, it was great to be able to see Kyle Rayner again. I find that Robert Venditti is running with the ball that Geoff Johns originally kicked off. He is picking up a lot of the plot points and threads from Johns run on Green Lantern. Hal Jordan again seems to be the most important man in the universe once again. I apologize for the sarcasm, but that's how Johns made him feel, and now Robert Venditti is establishing that again. The only downsides that I felt, was that John Stewart feels like a jerk at times, which really is Guy Gardner's role. I hope that Venditti does more with the rest of the Lantern Corps in the future. Obviously we are reviewing this book, because Brainiac is involved. So I was a little disappointed that the reveal of the Grand Collector was Larfleez and not a "Brainiac Prime". It will be interesting to see how Larfleez gained control of Brainiac. I wonder if his ring has power over Brainiac's Colu mind, or did he do it in some other manner? Time will tell. I look forward to the next issue. Art - 5: I was surprised that Ed Benes had taken over the duties for this issue. I'd have thought it may have been Ethan Van Sciver, as he and Rafa Sandoval rotated on the art duties. Don't get me wrong, I love Ed Benes work. He is a great visual story teller, and has been a great asset to DC for over a decade now. There was a shift in the art styles obviously, and that is even more evident with the lack of an inker. Even with tight pencils, you lose of the sharpness that an inker provides to the page. The page definitely looks softer without inks and colors straight over the pencils. Ed is great at drawing females. He and J. Scott Campbell are cut from the same cloth in that way, but here, Benes showcases that he's also great at the traditional superhero stuff. Solid figure work. Cover Art - 5: The regular cover by van Sciver is amazing. I love the composition of Kyle reconstructing Hal in a way. Kevin Nowlan's variant I like quite a bit also. Like I've mentioned in the past, I love this look for Brainiac. It's such a great piece, which I think would look far better in Black and White. I'd love to own the original art for this.